The moving parts of washing machines are often connected by rubber belts, but even when they aren't, a malfunction can produce the smell of burning rubber around one. That's because the internal components of the motors and pumps, as well as the drive couplings, often include plastic and rubber seals. The acrid smell of burning rubber could indicate a slipping drive belt, but it could also signify internal mechanical or electrical problems. You're likely to smell burning rubber if you overload your washing machine. In some top-loading washing machine models, the tub is connected to the motor by a drive belt, and when this belt wears out or becomes loose, it can slip, causing a burning rubber smell when the tub is agitating or spinning. This may happen only when the tub is overloaded, and it's usually accompanied by irregular motion of the tub. Similarly, the drain pump may be connected to the main drive motor by a belt, which can also slip and cause odors. This belt can slip when an obstruction is caught in the pump. Worn pulleys can also be responsible for slipping belts. 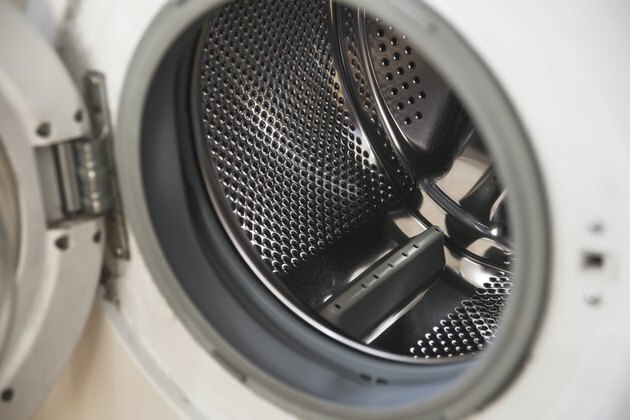 Whether the main drive motor is connected by a belt or by a direct coupling to the tub, overloading the washing machine can put enough stress on it to cause it to overheat. This also produces a burnt-rubber smell, albeit one tinged with the smell of burning electrical components. When this happens, you're likely to hear a buzzing or humming sound coming from the motor, and the tub won't agitate or spin. An obstruction in the drain pump that prevents the impellers from spinning can produce a similar effect in the motor that drives it, whether it's the main drive motor or an auxiliary one. If the main drive motor has a direct coupling to the tub or to the drain pump, the coupling includes a rubber component that buffers the action of the coupling. The coupling includes a drive fork that can wear out, and when it does, it strains the rubber and causes it to overheat. Overloading the machine exacerbates this condition. Top-loading machines often have a clutch that engages when the tub spins, and when this part wears out, it slips and produces an acrid smell. A worn clutch usually results in slipping and scraping noises during the spin cycle. Noting the operational symptoms of the washing machine and the approximate location of the source of a burning smell can usually help you pinpoint the problem. In almost every case, you need to remove the cover of the machine to make the repair, and you should never do this without first unplugging the machine. It's often possible to replace belts and couplings and drain pumps yourself, but if the problem is a seized motor -- or you can't locate the problem -- you should call a service professional. What Causes Squealing When the Washing Machine Spins?